So you have never done very much at all with boats and you think that you couldn't handle this? 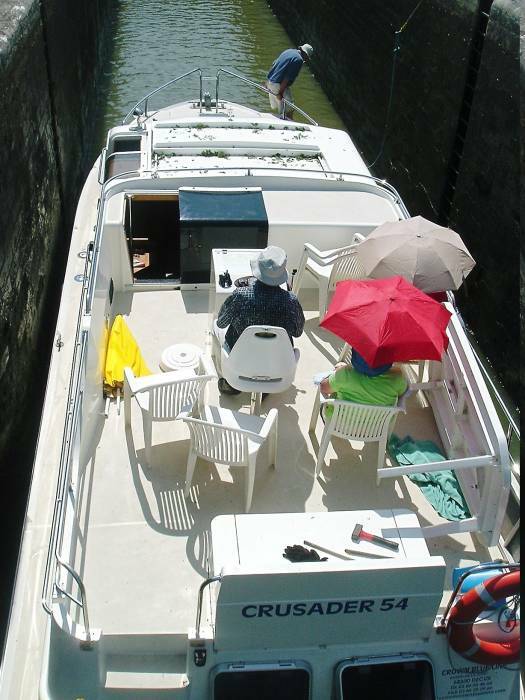 Don't worry, it is very easy to pilot a rented canal boat. The good news is that you really can't get lost in a canal unless you somehow wander off some side channel. 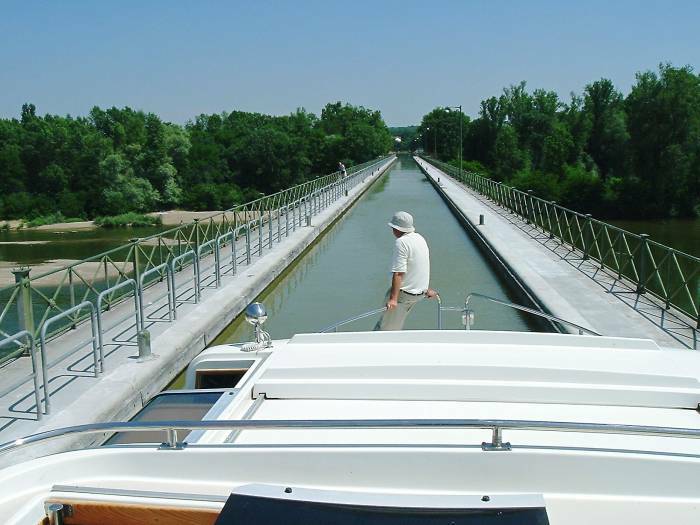 The canals are used by commercial barges, so they are well maintained. They are regularly dredged and lined with corregated hoarding as needed. The thing you have to learn is to keep the steering gentle and plan well ahead. A larger boat like the ones we rented has two helms — one down in the main cabin and the helm up top where there is great visibility. Speed is limited on the canal to limit bank erosion, so at low speeds in a large boat you also need to watch out for wind. Especially when approaching a lock! 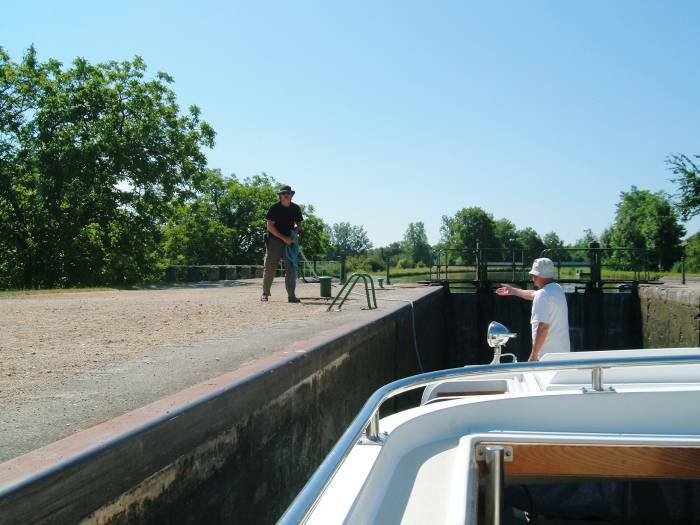 Some people motor right up to a closed lock gate and stop to wait for it to open. With no headway, they get blown all over the canal with the wind. And, when the gate opens and a boat or barge comes out, they have to do some frantic backing. 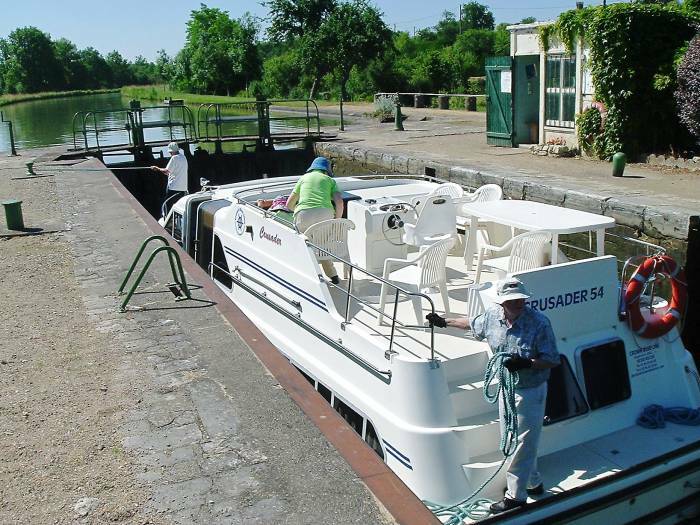 Some larger boats have a bow thruster, very handy when tying up or when entering a lock. The boat we rented the first year was about 13 meters long, fairly large as these rentals go, and we were fortunate as first-time boaters to have a bow thruster. 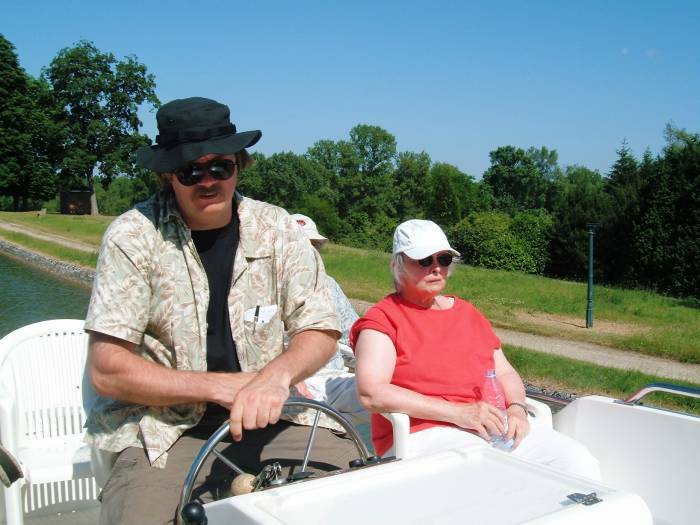 On the second trip we had a boat that was cosmetically identical, an older version of the same model. 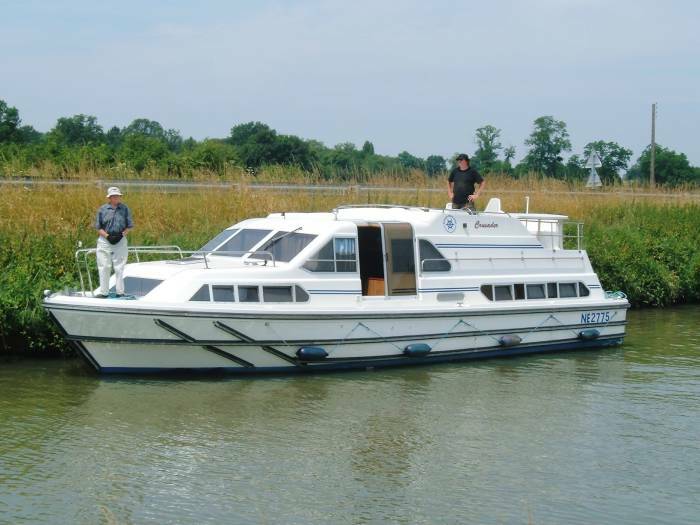 The most significant difference was that the older model did not have a bow thruster. It was no big deal, but it did mean that getting into a lock wasn't quite as easy as it would have been with the bow thruster to cheat. Me oversteering as Shirley is on watch. 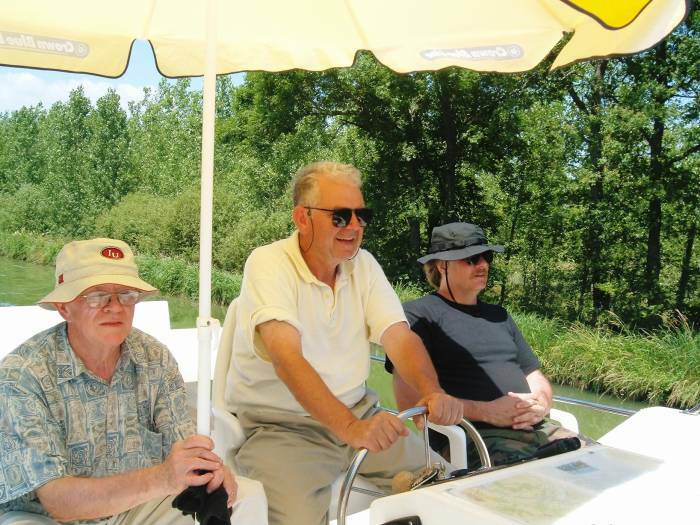 L-R: My dad, Larry, and me relaxing after we get the steering under control. What's called the gauge of a canal segment is really the limiting dimensions of the narrowest and shortest locks along it. There are also a lot of canals throughout southern England. 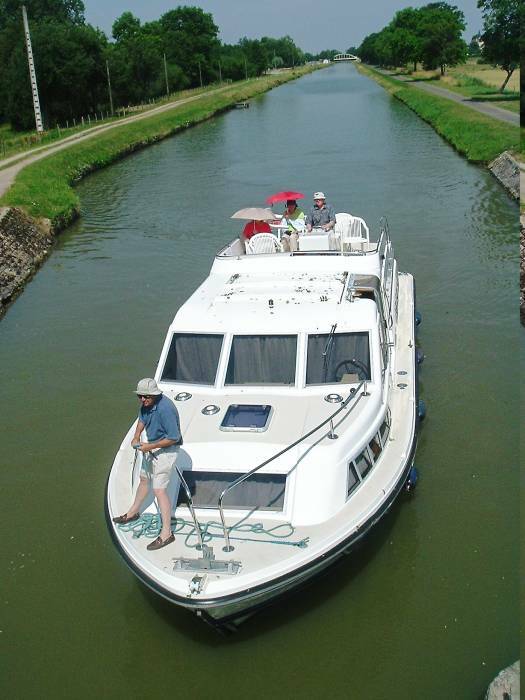 Most of those canals have a much narrower gauge, meaning that much leisure canal boating in England is limited to what are called narrowboats for obvious reasons. 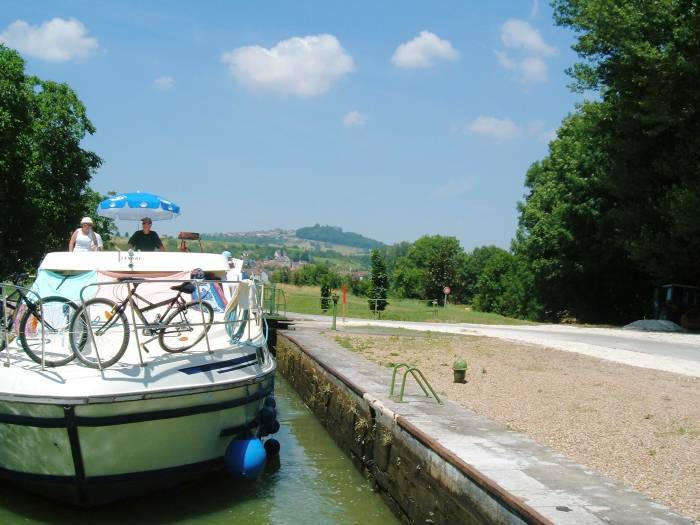 While you see some English narrowboats in French canals, meaning that their owners took them across the English Channel (or La Manche), you generally see much wider and more comfortable boats in the French canals. 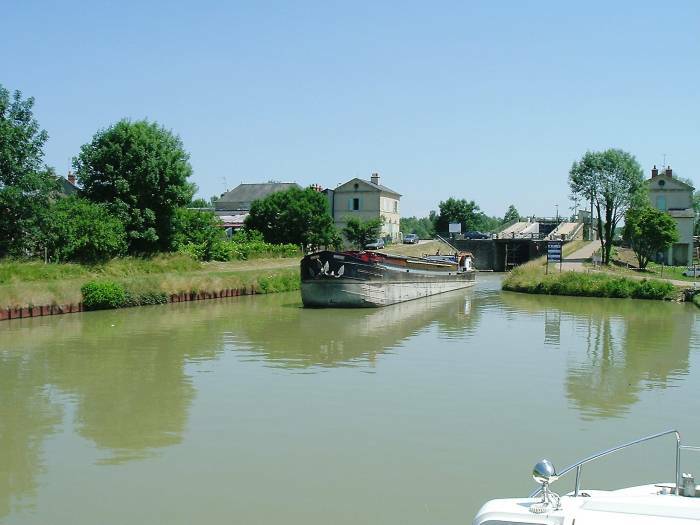 And, many of the French canals are still used for commercial traffic. Some of the commercial barges fill the locks. Generally it is not a problem to pass a commercial barge, although your first passing is tense because the channel of the canal seems awfully narrow! 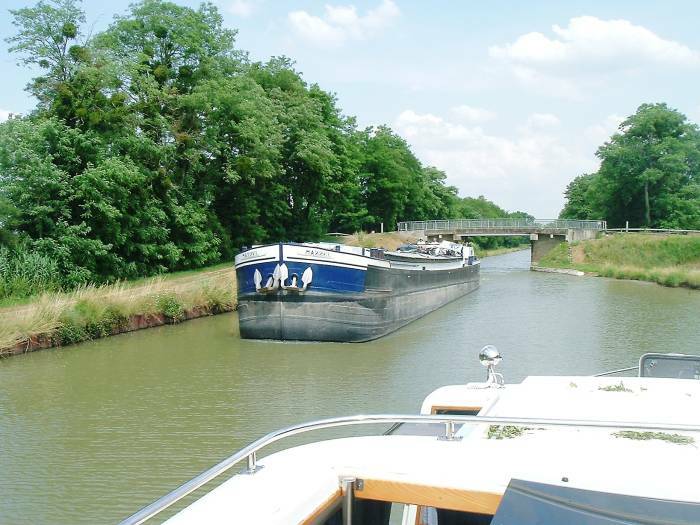 You certainly need to keep a careful watch for approaching barges, and make sure that you will have room to pass. If the canal ahead is narrow, you might need to stop immediately in a wider section to let the barge past. You're on holiday, but the commercial barges are working and time is money for them. Locks are not difficult at all, once you get the hang of the lock ritual. First, get your boat into the lock. Here we are in the lock with some other boats. 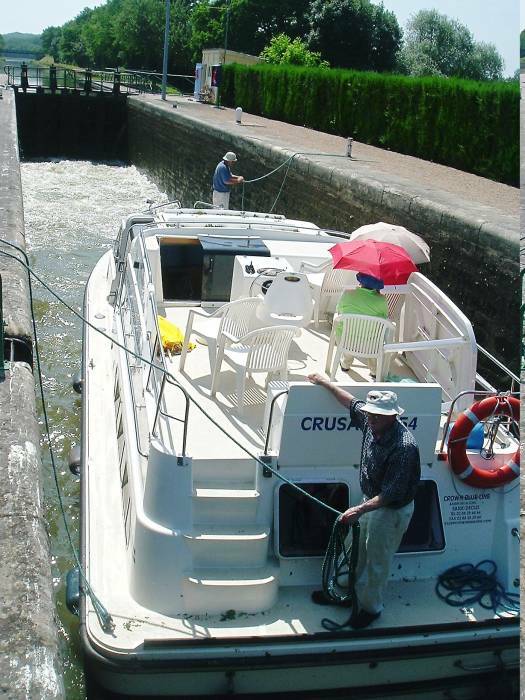 Since we were traveling in the canal paralleling the Loire river upstream, we went up in every lock except one. So you start down in a concrete-lined box. If you are going down in a lock, you do need to be very careful of what's called the sill of the lock. 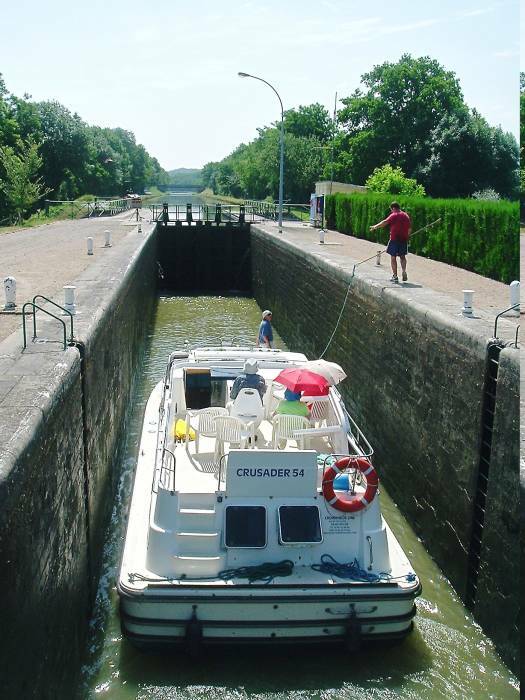 On some locks, the channel bottom of the upstream canal continues into the lock as a concrete sill, like a gigantic step extending into the canal one or two meters beyond the upstream lock gates. 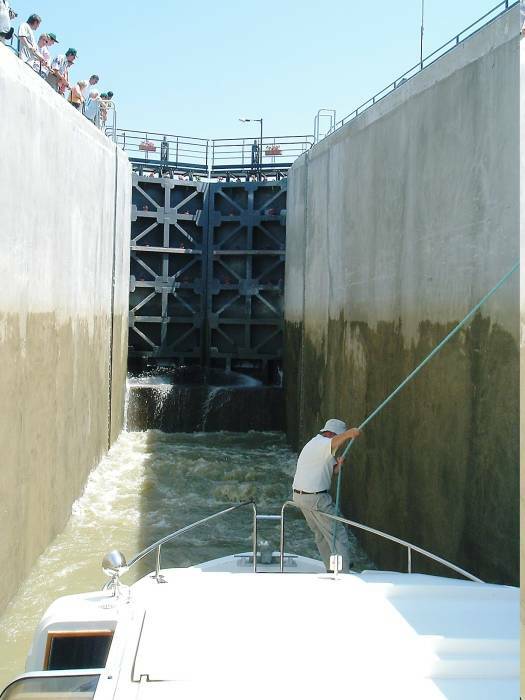 So, if you tie up too close to the upstream gates, too far to the back end of the lock as you see it in your direction of travel, the stern of your boat might be over the edge of the sill. When the valves are opened to drain the lock, the stern of your boat would be lowered onto the sill, damaging the propellor, the rudder, or even the hull itself. 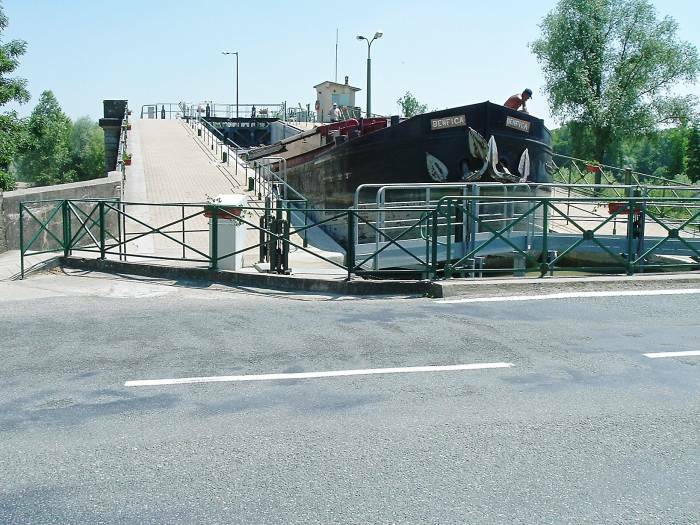 If the lock is staffed with a lock-keeper, they should spot this problem and warn you — but be careful! Get in, come to a complete stop, cut the engine, and tie in. This works out much better if you have someone agile enough to climb the slippery ladders built into the lock walls. So, it's good to have at least three people on board. 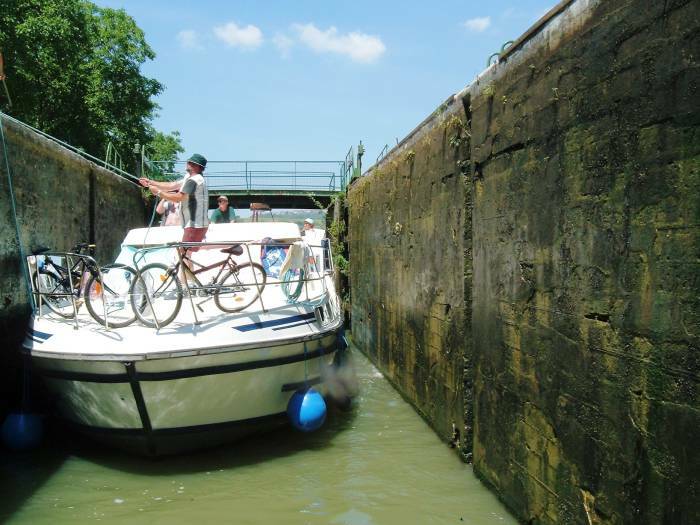 Yes, there will be a lock-keeper on some canals, but it's better (and more polite!) if you can handle at least some of the ropes for yourself. 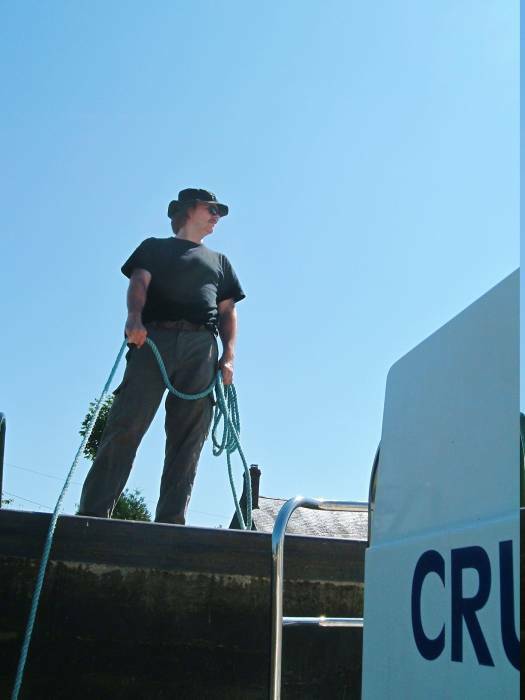 The lock-keeper has plenty to do without having to handle all the ropes for all the boats. I have climbed up onto the lock wall. Larry threw a line to me. I have looped it around a bollard and he is ready to take the free end back from me. Loop lines around bollards fore and aft. Of course you don't tie yourself to the bollard, since you're about to go up or down! What you do when going either way in a lock is tie one end of a line into a cleat on the deck. You pass that around a bollard on the edge of the lock, and manually keep appropriate tension on the other end. Larry is taking up slack as my dad prepares to throw his line to me. Loop the line around the bollard and the person handing it will take in or let out line as needed to keep the boat stationary while the lock cycles. Hand cranks close the gate through which you entered. Then other cranks open and close valves to cycle the lock. Then you crank the other gate open and leave. We're through the cycle and ready to pull out! And a few kilometers later you're ready to do it again. Some locks have a greater rise. And sometimes there is a flight of locks — you go up in one lock just to enter a second, and sometimes a third, and so on. Here we see a larger lock, the first in a flight of two. How will this work? It looks like this large commercial barge is about to cross the road! It's in that tall lock from the picture above, and that lock is full. 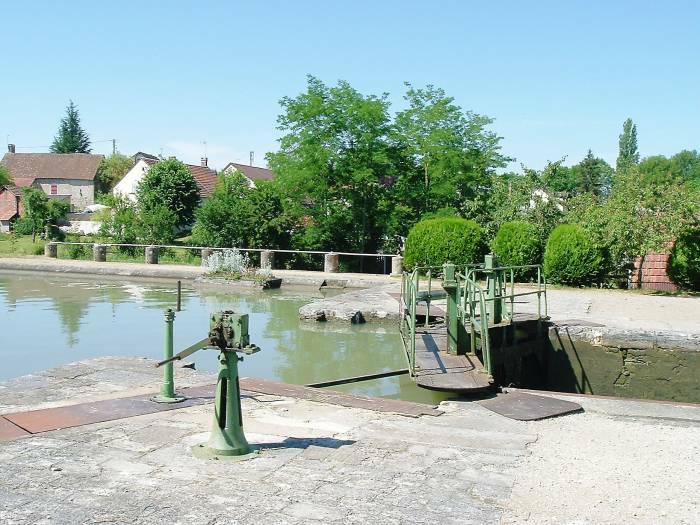 With both gates closed and the lower valves opened, the lock will drain to the level of the canal on the lower side. The water will drop far enough that the barge will pass under the road bridge. We have just entered the lower lock from the lower side. The tall upper gates are closed, and you can see the sill below them. 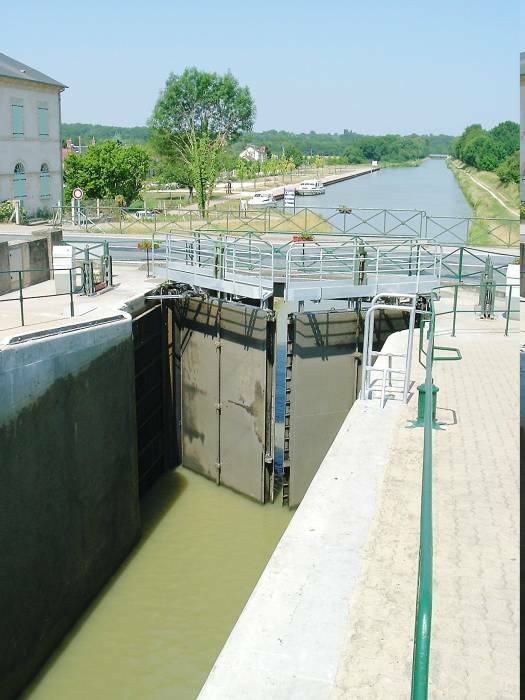 Higher locks tend to have this sill, so the gates don't have to be any larger than necessary. You have to be careful of the sill when going down! 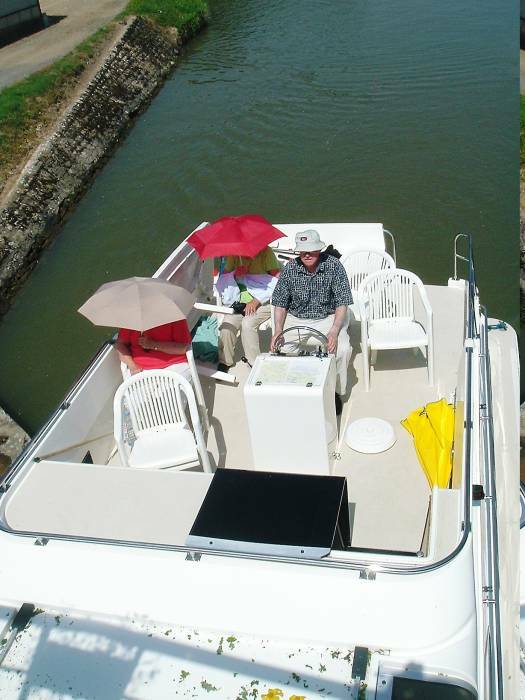 Drift back to the upper gate and you could hang the stern of your boat on the sill as the lock drains. These gates have valves in their faces. There are also valves that fill or drain the lock from its bottom. 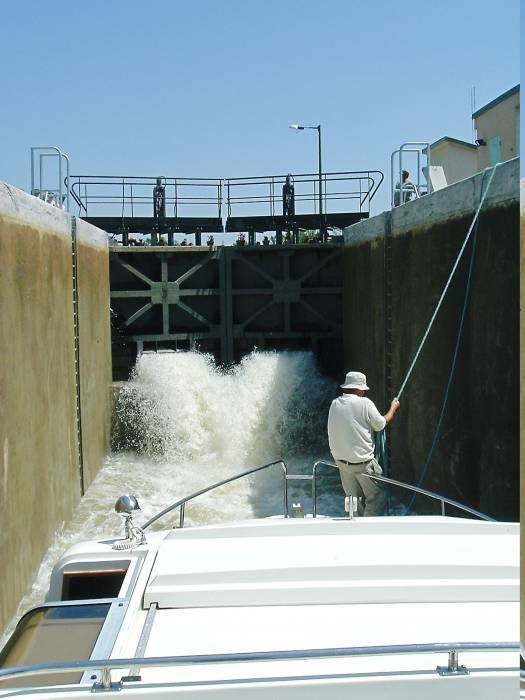 Either way, fast filling of a lock leads to a lot of turbulence and the need to keep your boat stationary. We are coming out of the upper lock onto a water bridge. 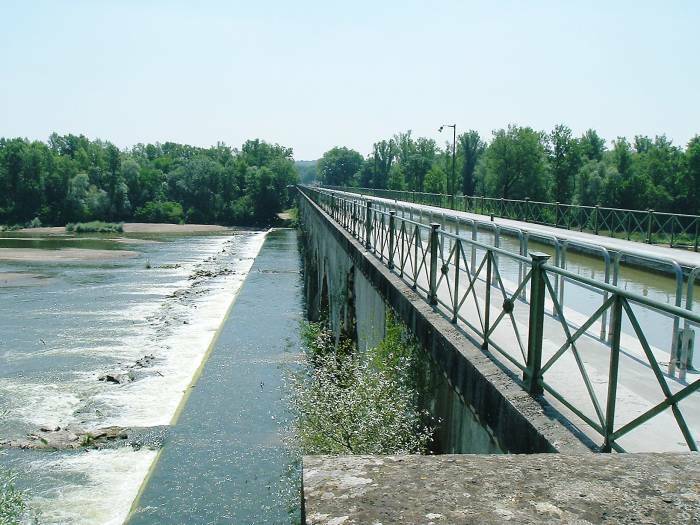 The Canal Latéral à la Loire crosses over this branching river on a bridge that contains the canal and a pair of walkways. Here's a view along the side of that water bridge.